I made this recipe last week at the tail end of a persistent winter cold—one that hung around aggressively for ten days, rather than the five or six I’m used to for that kind of illness. I was tired and congested, and I craved something nourishing, hearty, and—to use a word that a friend recently reminded me of—gloppy. 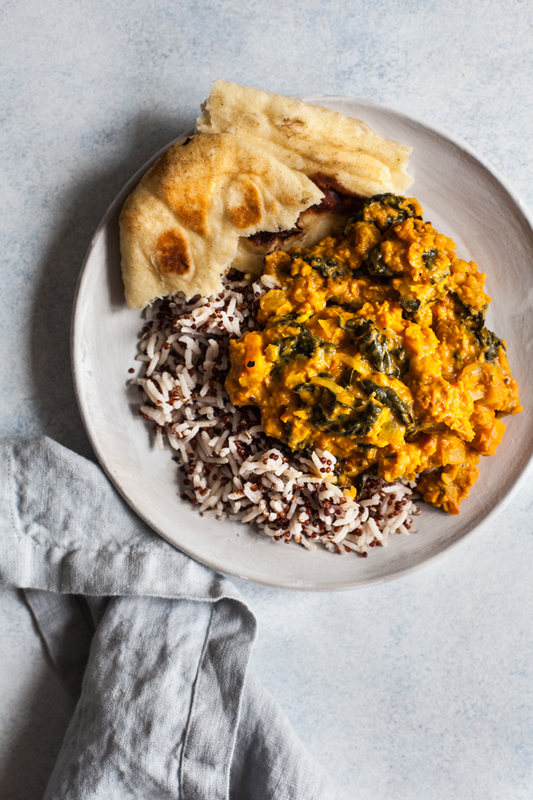 These creamy tomato coconut red lentils proved to be the perfect medicine. The recipe came together easily because I had nearly all of it in my pantry: canned tomatoes, coconut milk, red lentils, spices. 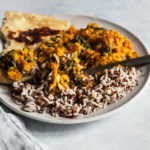 It’s just the thing for a busy night or a moment when cooking isn’t very appealing, but the idea of something thick and spiced and stewy really is. 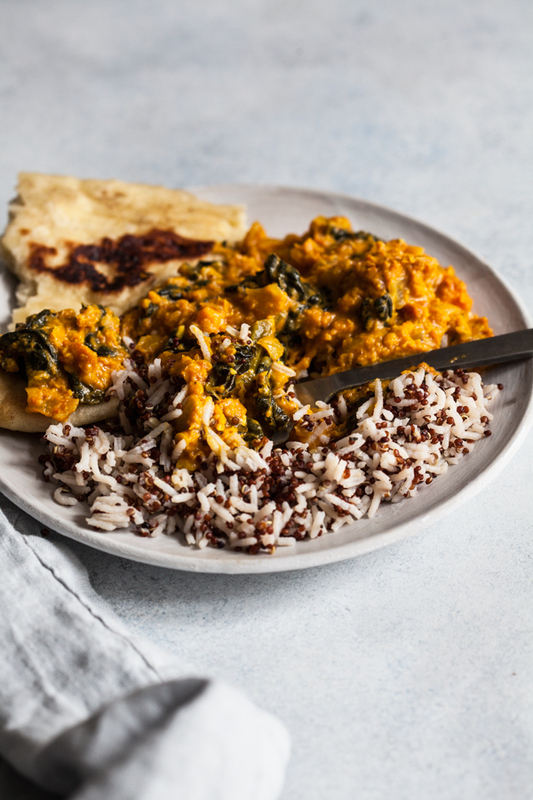 I hesitate to call the dish a dal, because the way I prepared it wasn’t at all traditional. But I guess it’s dal-like, just thicker, and you could eat or serve it similarly. 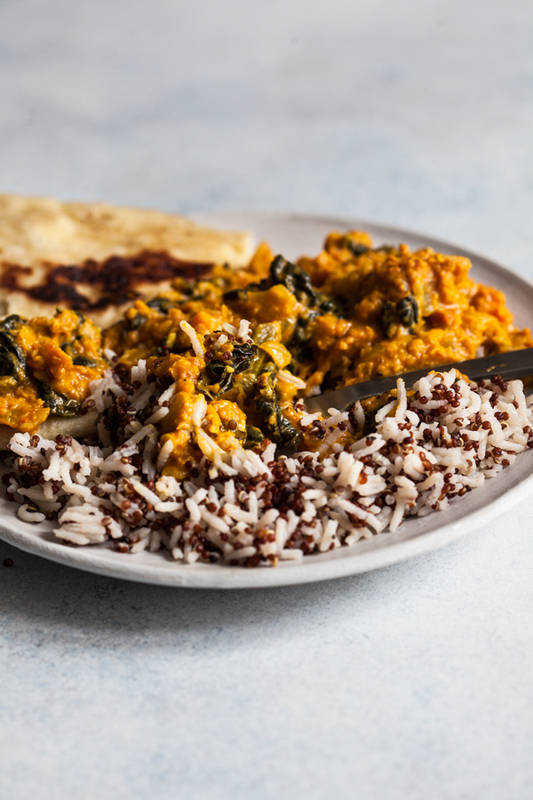 It’s perfect for scooping up with naan, or plating along with steamed greens, and/or cooked rice. 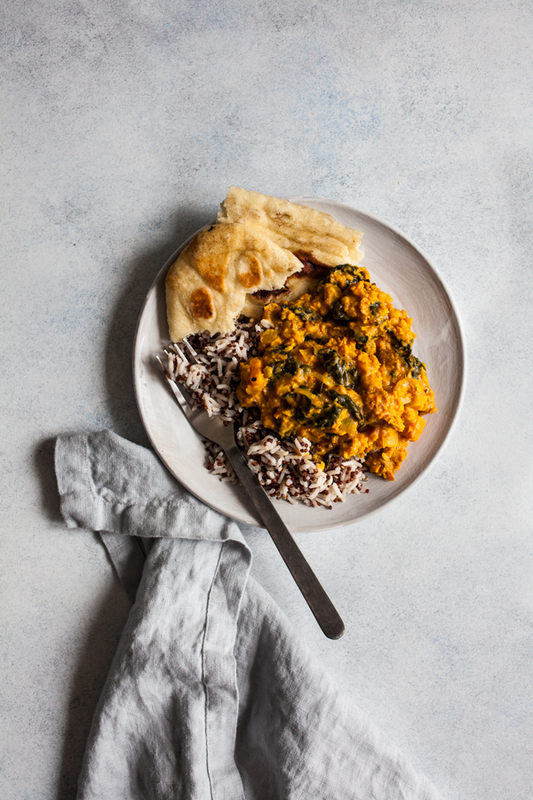 The grain mix you see in the photos is actually a mixture of red quinoa and white basmati rice, which I adapted from one of Divya Alter’s recipes in What to Eat for How You Feel (a good book for when you’re all sniffles an an aching head). 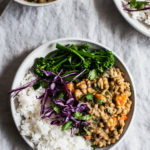 I added kale to the recipe at the end, because it’s my habit to incorporate greens into this kind of stew-like dish when I can. You can leave it out, or you could add spinach or chard or even chopped broccoli florets in its place. Heat the oil in a medium sized pot over medium heat. Add the onion. Cook for 5-7 minutes, stirring every now and then, or until the onion is clear and soft. Add the garlic and ginger and cook for another 2 minutes, stirring constantly. Add the cumin, turmeric, coriander, and cinnamon; stir the spices with the garlic and onions for a minute, until everything is very fragrant. Add the red lentils, sweet potato or winter squash, tomatoes, water, and salt to the pot. Bring the mixture to a boil, then reduce the heat to low. Cover and simmer for 15 minutes. Uncover the pot, give everything a stir, then add the kale. Once the kale is mixed in, re-cover the pot and cook for another five minutes. Finally, stir in the coconut milk or cashew cream. Taste the mixture and adjust the salt as needed; add black pepper to taste, as well as some lime juice if desired. 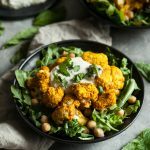 Serve with a cooked whole grain, naan, vegetables, or all of the above! Leftovers will keep in an airtight container in the fridge for up to four days. They can be frozen for up to 6 weeks. The homemade naan in the picture, by the way, is an all-purpose version of Alexandra’s awesome spelt naan bread! I didn’t have spelt flour on hand, but I’m excited to try the recipe with a half-and-half mixture of spelt and AP, or all spelt next time. It’s as simple as Alexandra says it is to make, and the naan is super tender and tasty. I’m glad to have had comfort food like this around to bring me back to feeling 100%. And I’m grateful for the leftovers in my freezer, since my first day of the spring semester is tomorrow, and I’m about to fall back into the swing of a working student schedule. If you try it, hope the meal is comforting to you, too. I’ll be circling back on Sunday with the usual reads and beautiful recipe links. Be well, and stay warm. Slow Cooker Masala Lentils + Hamilton Beach Slow Cooker Giveaway! Looks amazing, going to try it. I hope you feel better. I was suffering from the same cold as well. It was a tough bugger. I made this last night and I would definitely make it again but with a few adjustments. I think adding a little fresh ginger in with the garlic would add some nice flavor. I also found the spices to be a bit mild, but that might just be my preference. The tomato coconut combo is so tasty, it’s definitely inspiring me to try that in other recipes. I garnished with cilantro and lime juice and threw in some lacinato kale for the last 5 minutes. Oh man, Molly! I did include ginger in the recipe, but I neglected to write it down in the recipe. Completely my error, but your comment reminded me that it had been there! So: good instinct on your part, and thank you for jogging my memory! As for the other spices, they can absolutely be increased to suit one’s preferences. Glad you enjoyed. I will definitely try this. Sounds so tasty. My kids love lentils. I am totally going to try this. Thank you for the wonderful recipe. I love lentiles and the thick creamy sause was a very nice touch. Hubby loved them. Thanks again!